December 31, 2009 - Transport Workers Union reports American Airlines is the only major air carrier that keeps the bulk of its repair work here in the United States. TWU members who go through necessary background checks and training maintain AA planes and ensure passenger safety. Foreign maintenance allows companies to forgo employee background checks and FAA inspectors are forbidden from making spot checks and surprise inspections. TWU continues to fight to keep aircraft maintenance here at home and keep the flying public safe. Here’s what your boarding pass doesn’t tell you but you should know… Where was the aircraft you’re flying on last overhauled?? In an effort to save money and escape federal oversight, nine major air carriers reviewed by the FAA's Inspector General sent 71 percent of their heavy airframe maintenance checks to outside repair stations in 2007, up from 34 percent in 2003. That year, foreign repair stations received 20 percent of these maintenance jobs. In 2009 numbers are even higher. American Airlines is the only major carrier not exporting aircraft maintenance. Even Southwest Airlines, a 100 percent domestic airline, now flies its 737’s to El Salvador for major overhauls. Was your plane repaired by licensed aircraft mechanics? Foreign facilities, unlike U.S. maintenance bases, are not required to have licensed mechanics conduct repairs - only supervisors are required to be licensed mechanics. Some offshore bases doing work on U.S. aircraft have as many as 75 workers repairing planes for every licensed mechanic. Did FAA inspectors oversee the repair work? 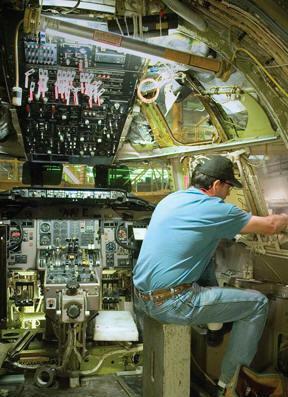 A 2008 report by the Inspector General at the Department of Transportation found that FAA and industry inspectors are not monitoring airplane maintenance work properly. The report documented that _awed inspections at repair companies are a widespread problem. In fact, the Inspector General's investigations found that FAA inspectors never even showed up at some foreign repair stations for as long as three to five years. Furthermore, FAA inspectors are forbidden from making spot checks and surprise inspections – common occurrences at U.S. overhaul bases. In fact, at major U.S. maintenance facilities FAA inspectors are present on a daily basis. What was the level of security in the maintenance facility? Did the workers in those maintenance facilities pass drug tests and background checks? Foreign facilities lack the high level of security present at US repair bases, drug testing of workers is not required nor are employees of third-party offshore repair contractors required to undergo rigorous background checks. Do language barriers create any safety problems? Perhaps most disturbing, many of the workers repairing U.S. aircraft overseas are incapable of reading repair manuals printed in English. Workers in these offshore repair centers are generally under severe time pressure to furnish work and often fail to find co-workers who can read the instructions. You have important choices when choosing an airline. Choose wisely. There is more to consider than price, time of departure and seat location. JetBlue, Southwest, and US Airways are among the carriers that have avoided oversight and cut corners by outsourcing major maintenance of their aircraft to contractors in El Salvador. Delta/Northwest and United send planes to repair facilities in Singapore, Beijing, Hong Kong and other Asian destinations. Remember this next time you book air travel. What can you do? If you are a frequent flyer, tell your airline that you value safety and don’t want them to cut corners when it comes to airplane maintenance. Contact your member of Congress and ask them to support tougher requirements for aircraft maintenance. Remember next time you fly that American Airlines is the only major carrier that keeps the bulk of its repair work here at home.